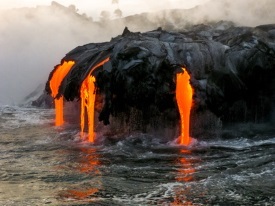 Kilauea is the youngest of five volcanoes that make up the island of Hawaii. It is one of the most active volcanoes in the world today, spewing enough lava and other material to pave a road across the world three times! Kilauea has been in continuous eruption since 1983. Local legend says that the volcano is home to the goddess of volcanoes, Pele.